In this round of Reading the Whitney Finalists, we come to the only author I have read previously. Shortly after my mission—whether a couple months or a couple years, I’m not sure—my youngest brother recommended to me Donald S. Smurthwaite’s I don’t remember why, exactly, but it was a book he liked and he thought it would meet certain requirements I had and I don’t remember exactly what I thought, but I certainly didn’t hate it like the book I had hated the book I had previously read and for which my brother had offered Julie Sloan as a healing salve. What I do remember is that Julie Sloan largely rose and fell on the strength of its narrative voice, and the same is true of Road to Bountiful times two. Loyal lives in North Dakota far from the rest of his family in Utah. Now that he’s old, his daughter Barbara’s talked him into moving into an assisted-care facility in Bountiful. She pays twenty-four-year-old Levi $600 to go pick him up. He does, initially intending to make the trip in record time. Instead, of course, it becomes a life-changing experience for both men as they slow down and get to know each other and go fishing and stuff. That’s the outline. No surprises there. The only real question is how successful is the process of execution. Which is to say, now that we’re done talking about the plot: spoilers. Smurthwaite’s set himself a difficult task in this book. Not only does he need to maintain two separate narrative voices, he also needs to have them slowly merge over the course of the novel while remaining distinct. No easy task. Levi is fast, zippy, repetitive like a beat poet. Loyal runs slower yet is similar stylistically. Almost as if to prove Loyal is not Levi, the old man crawls when in dialogue—at least at the beginning—but as the chapters continue, Loyals’ voice begins to be overwhelmed by Levi’s. And not just in dialogue, but in narration as well. Levi’s narration often slips into joke structure (“This seems apocalyptic. Biblical. Just plain ugly.” ) while Loyal can sound like an older, more mellow Sphinx at times, almost as if Smurthwaite felt a need to pad his way to 179 pages with more (increasingly hollow) wisdom from Loyal—and, as he moves from jokes to jokey wisdom, from Levi as well. In the last couple pages, for instance, as Levi sums up what we’re supposed to learn from this novel (and not for the first time), he spends the majority of his words saying what’s already been said (or simply shouldn’t be said) which dilutes the power of what is, quite frankly, a killer final line—a line that could have done all that lifting more efficiently alone. 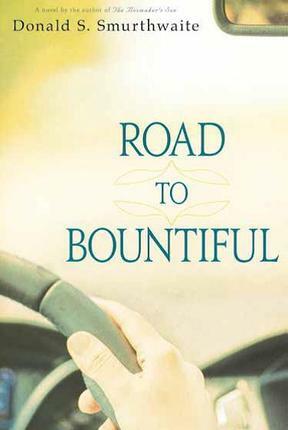 Which is a nice segue for me to leap in and say that although I will certainly get into the book’s flaws, in the end, Road to Bountiful won me over. I liked the voices up front, thought they lost their way for a while, was frequently frustrated by the fifty pages of writing that could have been excised, but, ultimately, I cared for the characters and believed in their arcs. A couple reviews I’ve read complain that Levi is too young for his age. I appreciate that complaint, but who besides Mormons thinks twenty-four-year-olds should be settling down with a wife and a finalized career path? He’s young. Let’s face it. The real problem with Levi is that he is so fippant and so silly and so unmoored and so swiftly jetting from stimulus to stimulus when, in order for the plot to get started with a minimum of authorial effort, he also has a deep history of living slow, whether it’s long mission afternoons spent with Filipino grandpas, or post-mission days spent hiking and fishing in the Uintas. Levi, in other words—flipping from flippancy to depths—is foolishly inconsistent. I’m not sure how vigorously I want to defend my complaint against Emerson. Yes, fictional characters need to be more realistic than real people otherwise we fail to keep our disbelief suspended. But, then again, as long as it’s not impossible, shouldn’t we go along with the author? Sure, I guess so. So while Smurthwaite’s introductions of inconsistencies are frequently clumsy, after another seventy or ninety pages he gets the kinks worked out and the characters function just fine. The novel’s balance is unsteady in terms of theme as well. For instance, one of the latter introductions is the preaching of contentment. Loyal, having trained Levi in the art of the slow (ready for your next crosstiching project: “Slow down and gain” ), now needs to teach him the value of contentment before they separate. But, as you can see from our embroidery project, slowing was not presented as a means to not asking for more. In fact, “contentment” is used as a bromide against Utah’s get-an-MBA-or-at-least-buy-an-MBA’s-house culture while at the same time encouraging seeking-out-good-things. As I explain it to you, I’ll bet you can parse the difference between these two types of desire. However, the character’s don’t seem to notice (or feel a need to reconcile) this—wait for it—inconsistency in their philosophy. He walks to me, sloshing through the creek. “Here,” he says. And he takes my line and gently undoes the knots and loops. “Here,” he says. And he stands behind me and puts his left hand on my left shoulder, and he takes my forearm in his strong right hand. “Here,” he says. And with his right hand, he pulls my arm back. Gently. I feel the rhythm of his motion coursing through my shoulder, my arm, my hand, my fingers, to the whippy rod. “Here,” he says. And we rock a little, back and forth, and the line splits the air, and I think I can hear a zizzing sound. “Here,” he says, and he stops the forward motion of my hand and arm, and I watch the tiny fly float on unseen currents of air, dainty in its arc, the white speck of feathers settling on dark waters. The rest of the time he is near me, keeping watch. . . . More than once, I did briefly lose my footing. And when I did, he reached out and steadied me and always said just one word. And after I was straight on my feet and balanced, he always just said a second word. Pretty good, right? Sadly, this scene becomes a motif mine, some of the ore of which gets reformed and reformed into near meaninglessness, but Smurthwaite is capable of truly lovely moments. He presents masculine relationships honestly, capturing the sharing of secrets to create closeness and the keeping of secrets to maintain that closeness. And so while I get tired of Levi’s occasionally absurd narcissism (see the biker bar scene) and every random character talking just like him (see the biker bar scene) and the fifteen-pound-sledge lesson-learning (see the words on grace at the end of the biker bar scene), in the end I was charmed by the book and enjoyed it quite a bit. Cut out the stally philosophizing and the ending is even beautiful. And I certainly am happy to take perverse pleasure in any book that manages to make entering Utah symbolically equivalent to leaving Eden. Welcome to Utah! The lone and dreary world. It sounds like the story could have used another plot thread, both to help maintain interest and to force some tightening up in other areas. But having not read the book, this is only my reaction to what I hear you saying. And yes, the high-priest book is his. I didn’t know it was a collection. That’s interesting. Okay, I was wrong. It’s a novel. Says so right on the cover! It could be connected stories but labeled a novel so as not to freak out the Seagull crowd. Another aspect of modern culture it hits on that I did not address (but was the first thing my father—whom I gave to book to—noted) is big boxes overwhelming moms-and-pops, industrialization of old age, etc. Oh: it’s critical of those things. Seagull is a discount bookstore in the Utah/Intermountain West area that was owned by Covenant, and was bought by the Church when they bought Covenant. Theric probably refers to a conservative bookselling and book-reading audience. I’m supposed to be doing that.